Complement your logo with modern styling for the modern workplace! This fashionable yet functional folder features "wave" styling on the cover with contrast stitching. The nylon material is soft to the touch and professional enough for your workplace. 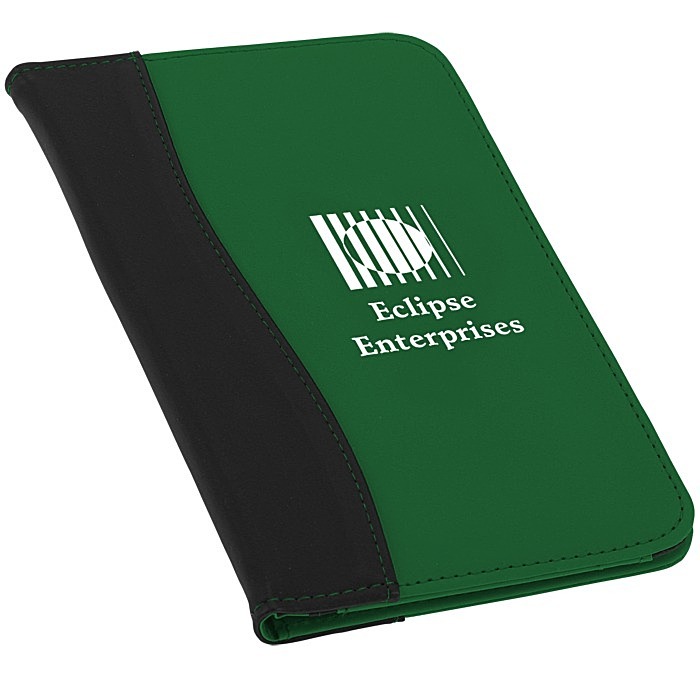 Keep all of your business cards in one place with four convenient card holders inside. Ideal for tradeshows, everyone will know who you are with the transparent ID holder. Jot down notes on-the-go with the handy elastic pen loop and 50-sheet 5" x 7" writing pad in this miniature portfolio. Give your business personality with one of a variety of colors to contrast the striking black accent on the spine. Your price includes a one-color imprint on the front.